Bellator 159: Caldwell vs Taimanglo (photos) » MMA H.E.A.T. 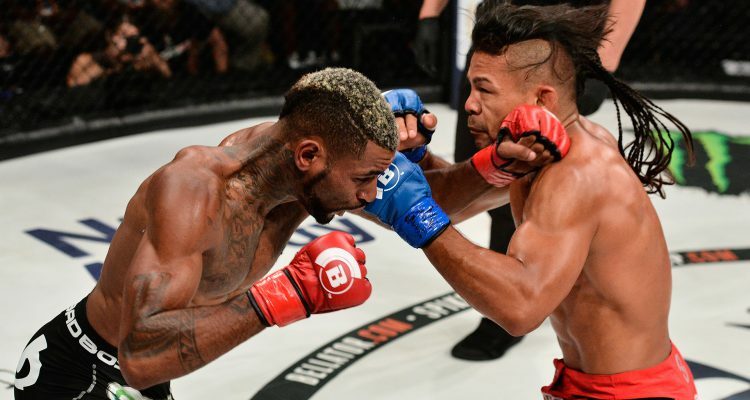 In the main event of the evening, Darrion Caldwell (9-1) was submitted by Joe Taimanglo (23-6-1) in an absolutely shocking upset :09 seconds into the third and final frame. With the defeat, the 2009 NCAA Div. 1 National Champion was handed the first loss of his career, while “Juggernaut” has the entire Island of Guam rocking with his guillotine submission win. “The Wolf” was cruising heading into the third and final frame, but after shooting for a takedown, Taimanglo slapped on a choke and didn’t relinquish the hold until Caldwell tapped. The fight was slated to be a title eliminator, but because of Taimanglo failing to make weight, it remains to be seen who will challenge next for Eduardo Dantas’ title. Melvin Guillard (33-16-2) put Dave Rickels (17-5) to sleep in front of his hometown fans during the co-main event of “Bellator 159: Caldwell vs. Taimanglo.” After 90 seconds of closely contested action, “The Young Assassin” caught “The Caveman,” then followed with a series of vicious elbows that ended the action at 2:14 of round one. After the fight, Guillard made it clear that he is done as a lightweight and will carry on his Bellator MMA career at 170-pounds, and hopes to fight renowned welterweight Paul “Semtex” Daley. Emily Ducote (3-1) handed Bruna Vargas (2-1) the first loss of her short career, landing an overhand right that she quickly followed up with a rear-naked choke, forcing the referee to call a halt to the action at :29 of round two. After the fight, Ducote dedicated the fight to her grandmother, who has helped her a great deal throughout her upbringing and supported her decision to pursue a career in mixed martial arts. Look for Ducote to make waves in the flyweight division in the future. In a fight that had plenty of title implications for both 145-pounders, Daniel Weichel (37-9) weaseled out a close decision victory against Emmanuel Sanchez (13-3) on Friday night, receiving the benefit of the doubt from two of the three cage side judges. Weichel has now been on the positive end of 10 straight decisions, while Sanchez has been involved in four straight consecutive split decisions. No Comments on "Bellator 159: Caldwell vs Taimanglo (photos)"